Artist statement: "Sheryl Oring examines critical social issues through projects that incorporate old and new media to tell stories, examine public opinion and foster open exchange. Using tools typically employed by journalists (the camera, the typewriter, the pen, the interview and the archive) she builds on experience in her former profession to create installations, performances, artist books and internet-based works." Greensboro, North Carolina: Sheryl Oring, 2015. Edition of 25. 4.75 x 6.75"; 8 pages. Accordion fold. Six original Polaroids taken at the East Side Gallery (Berlin) in November 2014 attached with self-adhesive photo corners. Black board covers with title label inserted in self-adhesive photo corners. Typed title label and colophon. Wrapped in newspaper from the day of the anniversary. Twine tie. Signed and numbered by the artist on the colophon. This is an offshoot of Oring's Maueramt project, which she did in Berlin on the 2th anniversary of the fall of the Berlin Wall. The East Side Gallery is a 1.3 km section of the Berlin Wall containing 105 paintings by world artists painted in 1990 on the East Side of the Berlin Wall as a memorial to freedom. Artist's Statement: "With this project, Oring explores contemporary views about the Berlin Wall in an effort to understand how people think about this divisive element of recent history 25 years after its demise. The work is structured as a series of public performances in Fall 2014 in which Oring sets up the portable 'Maueramt' at locations along the former wall and asks questions such as: 'What do you think about when you think about the Berlin Wall,' or 'What would you like the world to remember about the Berlin Wall?' Answers are typed on a manual typewriter onto small sheets of paper and collected for an exhibition at the Museum THE KENNEDYS in Berlin. The exhibition also features Polaroid portraits of each participant." Brooklyn, New York: Fargo Books, 2012. Edition of 10. 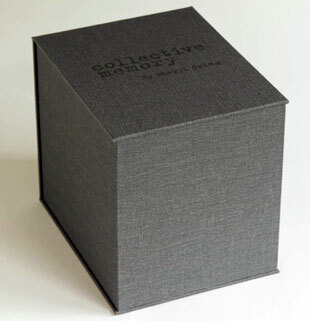 6 x 7.5 x 6.5" hinged Buckram-covered box handmade by Brooklyn-based Talas with the title die-stamped on cover. 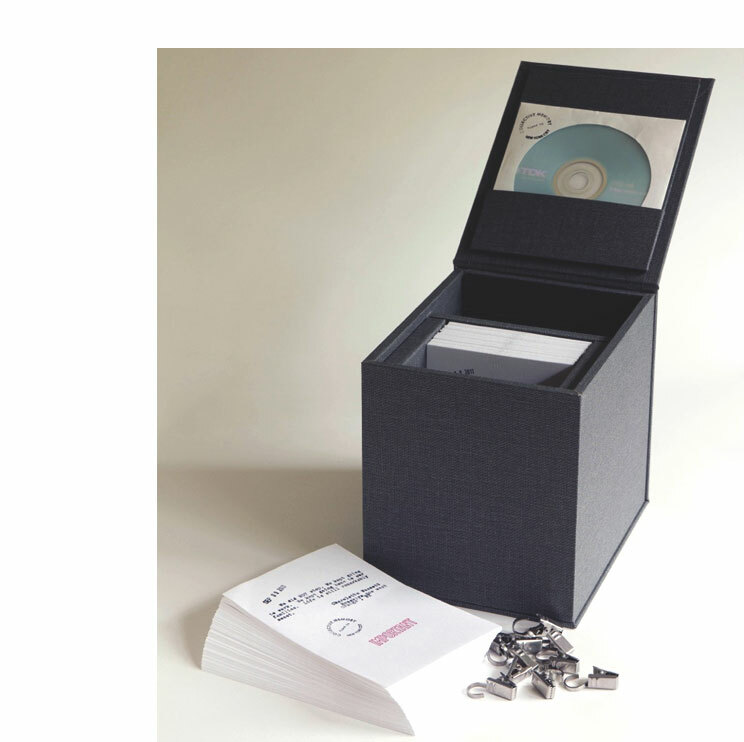 This customized box has separate sections/compartments for 4x6 cards, magnetized steel clips, and a DVD. Collective Memory is an interactive public art project created by Oring that she hopes will be used on college campuses in teaching about 9/11. Sheryl Oring: "The Collective Memory box functions as a portable exhibition based on the 2011 public performance of the same name held in Bryant Park, New York City, on the 10th anniversary of September 11th. Published in 2012 in an edition of 10, each box contains 315 digitally printed index cards with messages dictated during the Collective Memory performances held on September 9, 10, and 11, 2011. A pool of ten typists set up a public typing pool in the park and invited passersby to answer the question: What would you like the world to remember about 9/11? Answers were typed verbatim on blank 4x6" index cards, with participants adding rubber-stamp messages to each card. The cards were subsequently exhibited at the Weatherspoon Art Museum in Greensboro, NC. 4) a DVD with a 7-minute video documenting the performances"
Sheryl Oring: "I want to personalize this huge historical event in a way that many college students otherwise might not be able to. Hopefully the artwork will make people think about 9/11 and start some conversation." "Some park visitors replied on the spur of the moment. Some had heard about the project, the brainchild of assistant professor of art Sheryl Oring, and arrived with an answer ready. Some wept while they spoke. "The typists recorded more than 300 answers verbatim on small sheets of white paper. Another 200 people typed or wrote responses themselves during hours the typists weren’t available. "'It had a real impact on people visiting the park, even people who didn’t participate,' Oring said. 'It turned out to be a really contemplative way to memorialize 9/11. It’s time to start thinking about how we’ll teach 9/11,' she says. 'How do you deal with recent, traumatic history? How do you teach about this sort of complex event in a way that will be good for future generations?'" Brooklyn, New York: Fargo Books, 2008. Edition of 8. 5 x 6.75 x 3.5"; 198 pages. Includes 45 "birthday cards" and photographic portraits. 24 photos of the performances. 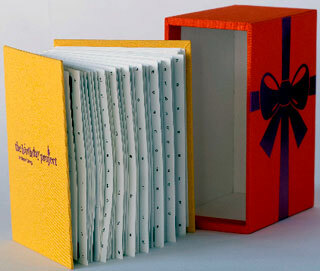 Bound in handmade yellow linen book cloth with foil-stamped images. 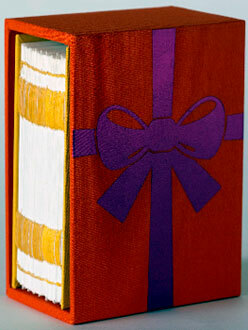 Slipcased in orange bookcloth with foil-stamped bow on one side and candles on the other. Introduction: "The Birthday Project includes a selection of birthday cards sent to President Bush by people across the country in 2006. The messages were dictated to artist Sheryl Oring as part of a public performance project that began Brooklyn and included stops in seven other locations across the country: Indianapolis, Raleigh, Tampa, Houston, Des Moines, Albuquerque, and Yosemite National Park. The portraits of people who dictated cards were taken by Brooklyn-based photographer Dhanraj Emanuel." In each of the locations Oring dressed in vintage secretary clothing. She set up a portable office at parks and flea markets in these locations and invited people to dictate birthday cards to President Bush for his 60th birthday. Oring typed participants' responses, gave the original to the interviewee in a stamped envelope addressed to the White House, and kept a duplicate for her archive and this book. The Birthday Project was featured on NPR's Morning Edition and in numerous media outlets. A grant from the Creative Capital Foundation helped fund the project and support from the Puffin Foundation contributed to this book. 1946 - a very good year, I'm proud to be an American, and I'm proud that our President is a good and moral man, God Bless you always. Even though I may not agree with everything you have done, I do respect you as President. I think you need to reconsider the stem cell research. I hope you have a happy birthday. I'm proud to be an American. Since you've taken office you've set back this country in terms of foreign policy, anti-corruption, environmentalism and a number of other areas. I have little doubt that history will see you as one of the worst - if not the worst - presidents. I have little hope that things will improve while you're in office. So here's looking forward to your leaving. Brooklyn: Sheryl Oring, 2006. Edition of 18. 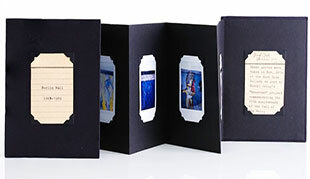 7.25 x 5.5" three-panel portfolio. Closes with leather ties. Bound in beige linen bookcloth by Jamie Munkatchy. Each book features an original Polaroid photograph of the Eldridge Street Synagogue or the surrounding neighborhood on the cover. 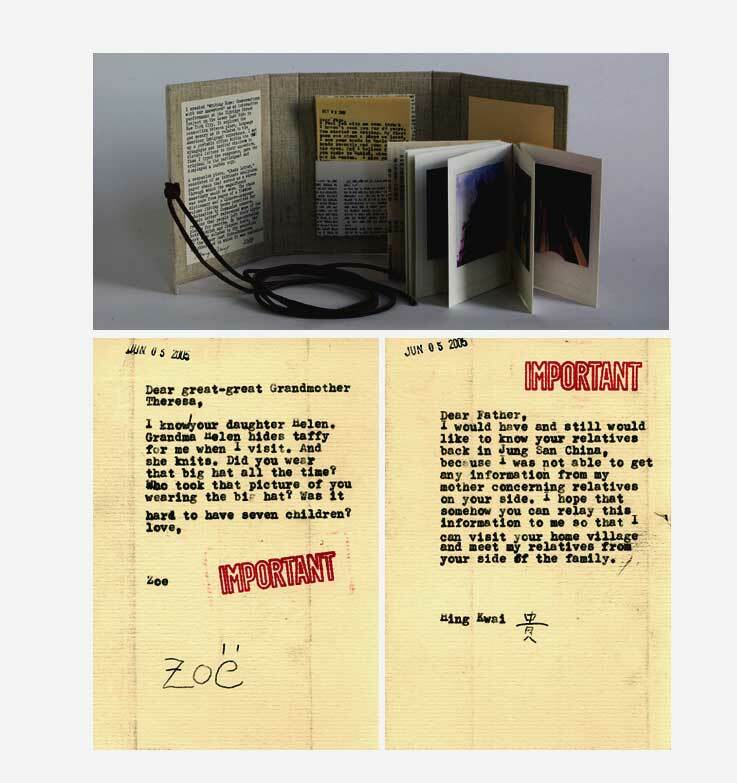 Contents include a hand-typed introduction; 43 letters dictated during performances at the Eldridge Street Project in 2005; and, a flag-bound book featuring eleven Polaroid photos of Eldridge Street Synagogue and the surrounding neighborhood. Inside pockets are made out of pages from a Yiddish dictionary and a Chinese-language volume listing books permitted for publication by Communist censors, alluding to the mixed nature of this Lower East Side-Chinatown neighborhood. This book was made in conjunction with a series of interactive performances – Writing Home: Conversations with our Ancestors — by Sheryl Oring at New York’s Eldridge Street Project. It explores the connection between place, language, and memory, particularly in reference to the American immigrant experience. For this project, Oring set up a portable office at the Eldridge Street Synagogue - built in 1887 and now a non-profit cultural center - and invited participants to dictate letters to their ancestors. 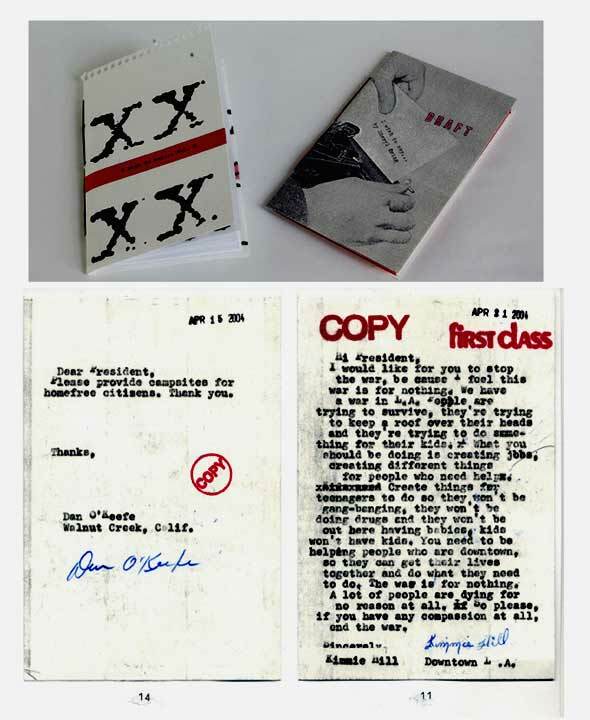 Using carbon paper and a vintage typewriter, Oring typed participants' response, gave the original to the interviewee, and kept a duplicate for her archive and this book. Oring continues to perform "Writing Home" at venues such as the International Center in New York City. Sheryl Oring: "I wish to say' grew out of my concern that not enough voices were being heard about the state-of-affairs in this county and my belief in the value of free expression that is guaranteed under our Constitution. "For this project, I set up a portable public office - complete with a manual typewriter - and invite people to dictate postcards to the President. "This ongoing project began in 2004 with a commission from 'The First Amendment Project in Oakland, California." 2008 - 2010. Special edition. 8.5 x 8.5"; 140 pages. More than 66 color photographs; 49 color illustrations. Bound in glossy illustrated wraps. 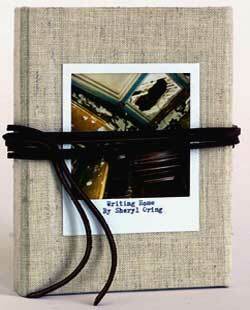 Preface by Sheryl Oring. Introduction by Thuy Linh Nguyen Tu, Assistant Professor of History of Art and Asian American Studies at Cornell University. Signed by Oring on the title page. Accompanied with a file folder of newspaper clippings from The Birthday Project. Miriam Schaer, Bonefolder, Volume 7, 2011: "Hillary Clinton popularized the maxim that it takes a village to raise a child. Sometimes it also takes a village to make a book. At least that's how several adventurous female book artists see it. ..."
"Again, Oring hit the road. She conducted an 11,000-mile cross-country trek to parks and flea markets in Brooklyn, Indianapolis, Raleigh, Tampa, Houston, Des Moines, Albuquerque, and Yosemite, among other locales ... 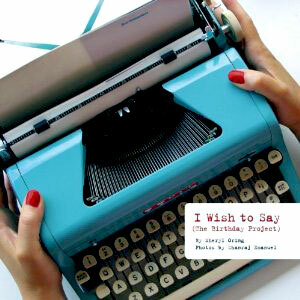 The result, I Wish to Say (The Birthday Project), was a full-color, 140-page book ... Packed with photographs by Dhanraj Emanuel, the book is a delightful exercise in cross-cultural empowerment." 4.5 x 7.25"; 28 numbered pages. Housed in an 11.75 x 9.25" manila folder that is closed on three sides. Title label at top of folder. 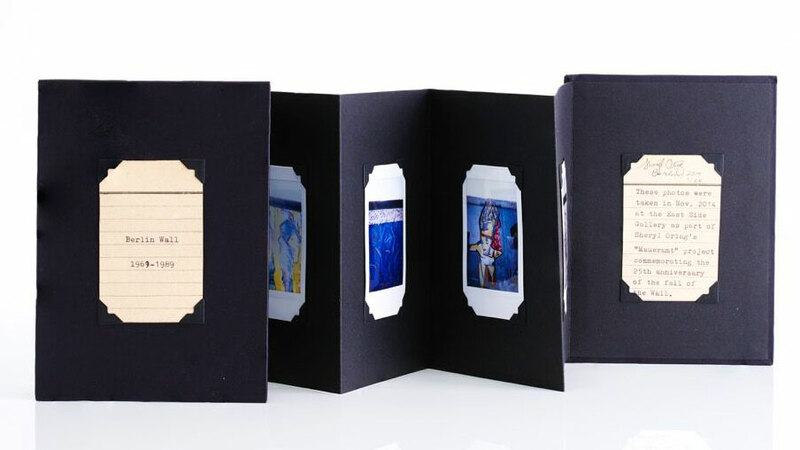 Includes a selection of cards created during performances in Los Angeles and Walnut Creek (California) in 2004. Combines art, politics, and interactive performance to offer the public a chance to say what's on their mind. Oring set up a typewriter and asked visitors "If I were President of the US what would you say to me?" The visitor's reply was then handtyped to a postcard addressed to the White House. With photographs by Dagmar Hovestädt of participants. I Wish to Say took form after many Europeans told Oring that all Americans think alike. Oring: "Because I had lived in so many parts of the country, I thought this couldn't possibly be true. This project is demonstrating to the world how diverse America really is….The response has been very emotional and very immediate. You get a very different view of the country talking to ordinary people." “Dear President Bush, It's unfortunate that you send men and women from all walks of life to war, to die for your America when you can't even give the basic rights of 'marriage' to people who are 'different' than you."